And we are back, friends, with more reviewing on Volo’s Guide to Monsters! I haven’t touched this series of updates recently, since I have been doing several projects for Dungeon Master’s Guild, but with this I hope to resume progress on my opinion on the text. Keep in mind that while I will aim to write about different aspects about the book, that I may not touch upon each and every little thing (that in itself is a massive undertaking!). Though, if you want my opinion on something specific, please let me know and I’ll return an answer catered to you. A commonplace complaint that I hear about 5th Edition is that people constantly want more playable races, and sometimes their requests are quite…odd. One of my players wanted to be a gigantic shark-man, which I allowed after he ingested a bad potion. Volo’s has presented us with many a number of sparkly new races for the most part. Aasimar and Goliath were already mentioned in previous texts for 5e, in Sword Coast Adventures and in the Dungeon Master’s Guide. I wonder why Eladrin, by proxy, are not mentioned here in this book? Hmm..
Firbolg: giant-blooded beings with connections to the fey. While traditional mythology has the Firbolgs as warrior druidic spirits, they made them seem more docile and peace loving over anything else. There aren’t any official races yet though which have both Wisdom and Strength as their racial stats, so this seems like the perfect build for Nature Clerics and Moon Druids. Hidden Step is also at-will invisibility which you can use once before regaining on a short or long rest. Kenku: glorified flightless corvids. Perfectly thematic for Raven Queen Warlocks (see my previous post for that! ), I find that the inability to speak naturally is greatly hindering and difficult for most players to do with success. You need to imitate others using Mimicry in order to get your thoughts across. While the challenge may tickle an advanced player’s fancy, it turns me off to the race as a whole. The rest of the racial boons are meh at best. 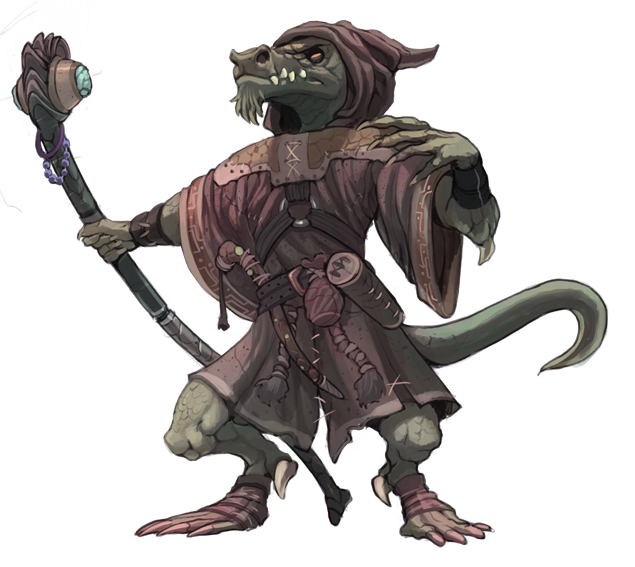 Lizardfolk: I can see fluff-wise Lizardfolk lining up with the Charlatan Background just from the ‘Cold and Calculating’ titled section, though their stats don’t lend to persuasive characters very well. Natural attacks, such as their Bite and Hungry Jaws, could be interesting if utilized to maximum capacity but in a game where the damage is a mere 1d4, I would not see much use for this. Hold Breath and the swim speed of 30 feet though could be invaluable, depending on the campaign they are played in. Tabaxi: the Khajit of D&D. 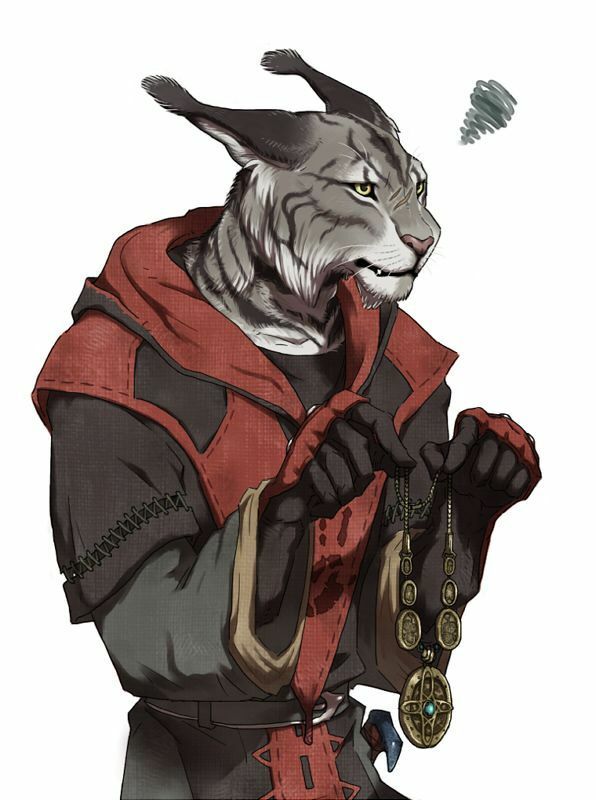 The lore of the Tabaxi is as bland as the Dragonborn (even though I do enjoy that race in particular, if done right) history, but the Personality Quirks do add some more substance to them. Any creature with a plus to Dexterity is always good as is Darkvision. Racial Perception and Stealth are another nice addition, though it suffers a bit from Natural Attacks like the Lizardfolk. 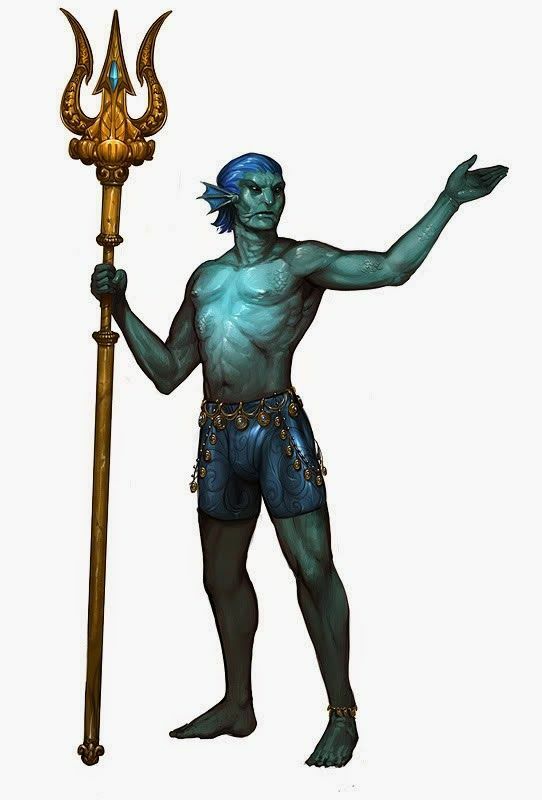 Triton: Don’t we already have something similar in the Water Genasi? I don’t like how they have an racial plus-one to THREE stats. They seem to have just too much stuff going on for them (innate spellcasting, communication of simple ideas with sea life, and cold damage resistance). In an ocean-faring campaign, these guys are the undisputed overpowered special snowflakes, though I suppose they at least make sense with the terrain. Starting on page 118, we are given even more odd races: Bugbear, Goblin, Hobgoblin, Kobold, full-blooded Orc and Pureblood Yuan-Ti. 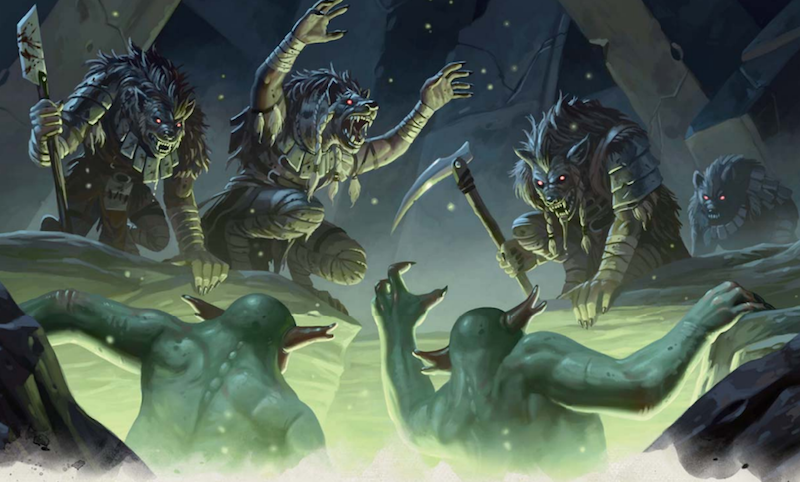 Not completly out of place with the lore sections in the front of the book, I wonder why they also did not add a section on Gnolls or half-Hags as monstrous race options. I am surprised that Orcs have a NEGATIVE to their racial stats (a minus two to their Intelligence), as I don’t think I have seen a race that has that sort of thing to their stats in 5e yet. Kobolds suffer a same fate, with their minus two going into Strength. So all of you who want to play Kobold Barbarians, you’re going to be at a disadvantage. Other then that, all of the options for monster races have increases which stay in line with the ‘plus one’, ‘plus two’ formula. Hobgoblin’s Martial Training seems out of place for a racial feature, as something like that is reserved mostly for a class such as Fighter. Though since most of their innate stuff is ‘meh’ at best, I would not mind it so much. Kobold’s Sunlight Sensitivity can be absolutely crippling if you don’t play your cards right, and Grovel, Cower and Beg seems thematically funny while situational. Though personally, I don’t like playing such cowardly things. Yuan-Ti Purebloods have a lot going for them, perhaps too much. I have heard they have levels of power creep to them, but I don’t terribly see it since their Innate Spellcasting is in line with any other race who has this. Though, Magic Resistance is a HUGE thing which people at higher levels are salivating for (mostly begging for a Mantle of Spell Resistance). Immunity and not just resistance to all poison damage as well as unable to be poisoned is also a huge thing, again though situational. Overall, I think the races add some good variety but should still be carefully considered for both players and Dungeon Masters. Firbolg and Tabaxi seem the most balanced and in tune with the format for what we have in the core Player’s Handbook, while Triton and Yuan-Ti should be kept on a tight leash. Feel free to disagree with me though, but do it in a civilized manner. There is over fifty pages of just new creatures to throw at your players (or possibly tame, if your Animal Handling skill is off the charts) as well as several new Non-Playable Characters. Of course, they include sections on what was covered in the Lore portions at the start of the book (Giant, Mind Flayer, Gnoll, Hag, Goblinoid). What surprises me the most though is just how many more fey creatures we were given. These include the Boggle, Darklings, Annis and Bheur Hag, Korred, Meenlock, Quickling, Redcap, Wood Woad, and Yeth Hound. While none reach over a CR 10 rating, there are significantly more terrifying choices then just a Green Hag or a group of Pixies turning your party into squirrels via polymorph. Such a sharp increase in these types of creatures makes me think they may have a new campaign module where the fey are a prominent part of the story line. But that’s just my hope. Five new Yuan-Ti? We already have three I believe in the core Monster Manual. How many more do we need? There’s two more Gnoll typings, technically three if you count the Witherling, and many throwback references to previous editions. Flail Snails and Grungs, for example, all hearken back to eras before 5e. Did I also mention there are dinosaurs in Volo’s? For the Moon Druid who wants to bring Jurassic Park to your table, now they can do so appropriately by turning into a raptor. In total, if your Dungeon Master has gotten everything they could ask for, this might be a good reference for them to have at their disposal. While most of the book tends to be lore heavy, which I understand some people may be turned off at the sight of, there is plenty of juicy bits to stay latched onto. The races can be considered experiments on the whole, with only a small handful seeming like they meet the balance scale of the Player’s Handbook criteria. Similar to the Unearthed Arcana content, it seems like most of the stuff that players can access here are in the early stages of being finished, though that does not mean the options are bad. The monsters are top notch, as is the artwork. I am particularily terrified of the Draegoloth, and I would never want to meet him down a dark alley in a tunnel system. I would give Volo’s Guide to Monsters a solid: 7 out of 10. I’ve seen a fair few DM’s outright ban the Yuan-ti Pureblood. And I’ll admit, if I were to run a campaign right now, I might too… it’s just so much more powerful than the abilities that other races possess. Mind you, I’ve also seen a few people criticize the Eladrin’s Misty Step (DMG, of course) feature and the Firbolg’s Hidden Step as being OP, which I disagree with. Someone else thought the Duergar spells (Enlarge and Invisibility) were OP as well, and I think that’s debatable. I think that we players are going to criticize just about everything lol. So long as you follow the standard rules set-up for innate spellcasting in playable races, they shouldn’t be too debilitating.